Among the many special collections housed at the Indiana State Library is the Holliday Collection, named for its donor and prominent Indianapolis citizen, John H. Holliday. Born in 1846, Holliday was raised and educated in Indiana and eventually founded the Indianapolis News, one of the city’s largest newspapers at the time. He briefly served with the 137th Regiment, Indiana Volunteer Infantry during the Civil War. He died in 1921 and afterward his estate donated numerous books, letters and other materials to the Indiana State Library. The donated collection contains hundreds of pamphlets covering issues of both local and national interest. These pamphlets were loosely grouped together by topic and bound into large and unwieldy books. Recently, State Library’s Preservation Department has been hard at work painstakingly removing them from their old bindings and fixing any damage. Afterward, they are sent to the Catalog Division to ensure that they can be searched via the online catalog. Here are some examples of recently added pamphlets covering various issues related to the American Civil War. 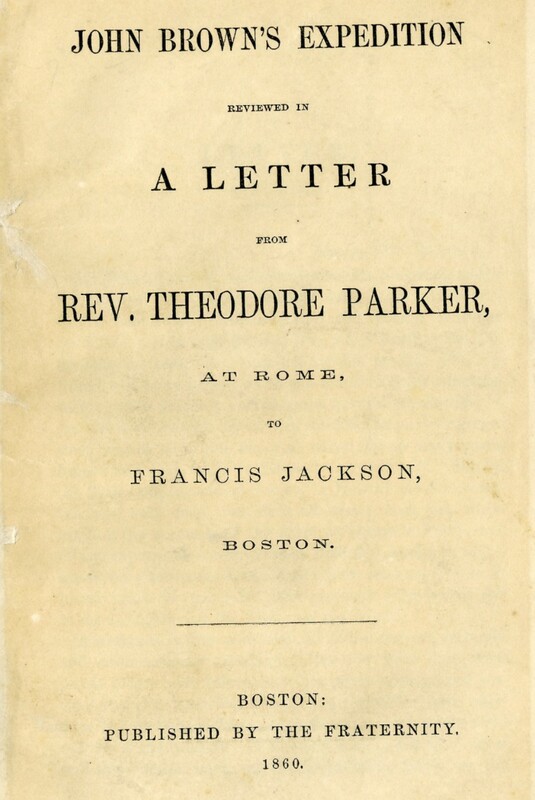 One of the earliest pamphlets in the collection is this tract by abolitionist Theodore Parker in which he defends John Brown’s attempt in 1859 to initiate an armed slave revolt after conducting a raid on the United States arsenal at Harper’s Ferry, Virginia. This pamphlet is a compilation of vignettes critical of the military actions of U.S. Army General George McClellan. 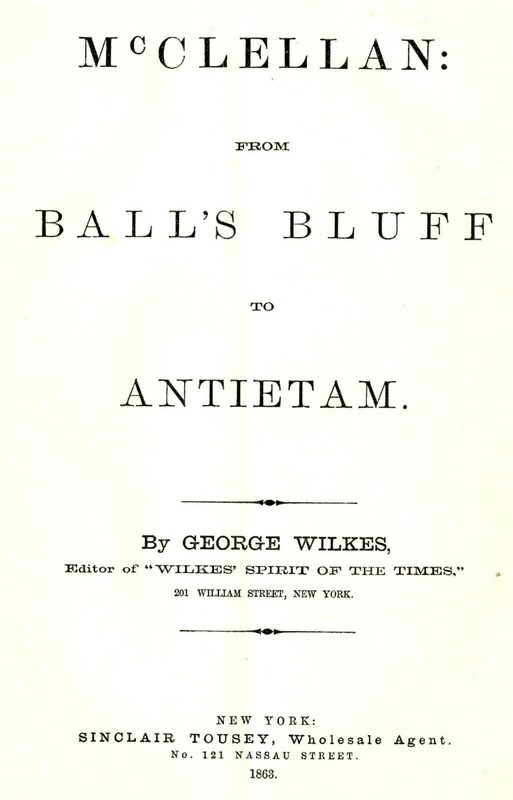 It was written by George Wilkes, a war correspondent who was present at many battles and whose public criticism of McClellan contributed to the latter being removed from command in 1862 after the Battle of Antietam. 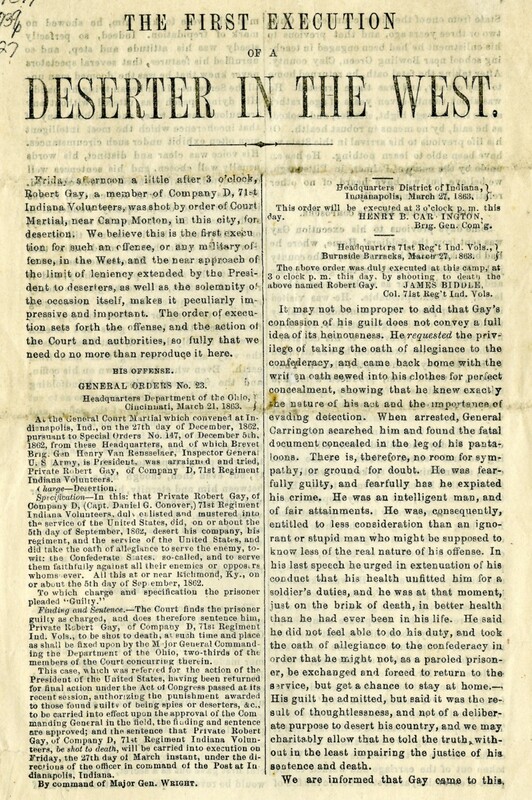 This leaflet describes the execution of Robert Gay, believed to be the first instance of an execution of a U.S. army soldier on the grounds of desertion. Gay, a member of the 71st Indiana Volunteers, was found guilty of defecting to the Confederacy and was executed March 27, 1863 at Camp Morton, located in Indianapolis. To find more materials on the Civil War, please search the Indiana State Library’s online catalog. In April, a staff member at the Mount Hope Cemetery in Topeka, Kansas contacted the Indiana State Library with a special request: In 1916, a Union Civil War veteran from Indiana had been laid to rest without a headstone and they were seeking out information in order to provide one for him. It became my task to compile as much information as I could on the deceased, Thomas J. Raybell, in order to ensure a proper and accurate headstone. I set to work on researching Raybell, first verifying his full name: Thomas Jefferson Raybell. I also researched his vital statistics. He was born in 1846, most likely in Miami County, Indiana and died June 22, 1916 in Topeka, Kansas. Ancestry.com is a great resource for finding this kind of information. Although, you do need to know the person’s name and have an idea of where they were born, lived, or died and/or a ballpark of those dates; especially if the name is common. Discerning his regiment and company was more difficult. In order to determine and verify his regiment, I cross-checked a combination of the muster rolls, the military records at the Indiana Archives and Records Administration and the Civil War Index website. Eventually, I was able to confirm that Raybell enlisted in Peru, Indiana, serving in Company F of the 109th. This was more difficult in part because the 109th was only in service for seven days in July of 1863! The 109th was organized to combat Morgan’s Raid, an incursion by the Confederate cavalry into Northern states by Captain John Hunt Morgan. They used two captured steamboats in order to cross the Ohio River and there was a battle in Corydon before the raiders moved toward the Ohio border. In the end, federal troops captured Morgan’s raiders in southeastern Ohio. 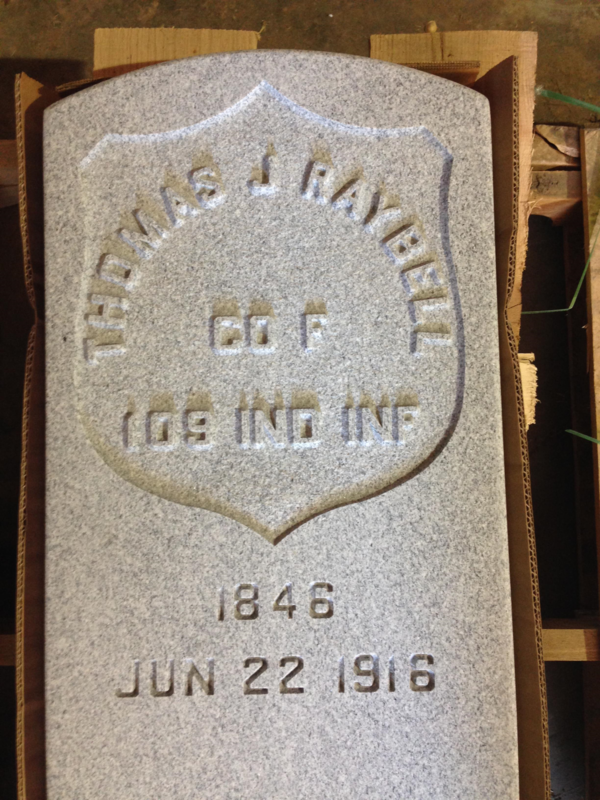 I’m proud to say that thanks to Fred Holroyd at the Mount Hope Cemetery, the Sons of Union Veterans Topeka and in a small part, the Indiana State Library—Thomas J. Raybell’s headstone has been created and will be installed after 102 years. I hope this gives a small snapshot into what archivists can do! 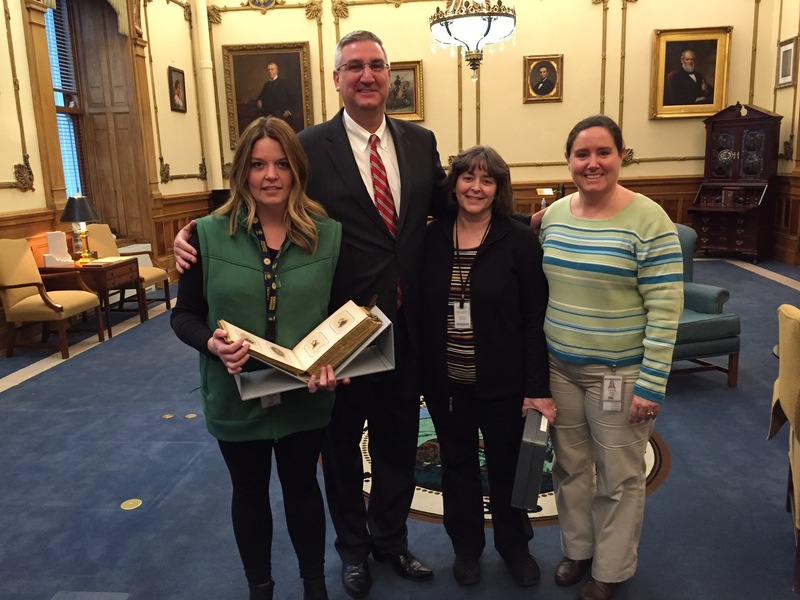 On Tuesday, Jan. 10, 2017, staff from the Indiana State Library met Indiana’s 51st Governor, Eric Holcomb. After learning he was an American Civil War buff, Associate Director of Public Services Connie Bruder, Rare Books and Manuscripts Supervisor Bethany Fiechter and Rare Books and Manuscripts Program Coordinator Laura Eliason presented a Civil War carte de visite album commissioned by Governor Oliver P. Morton. 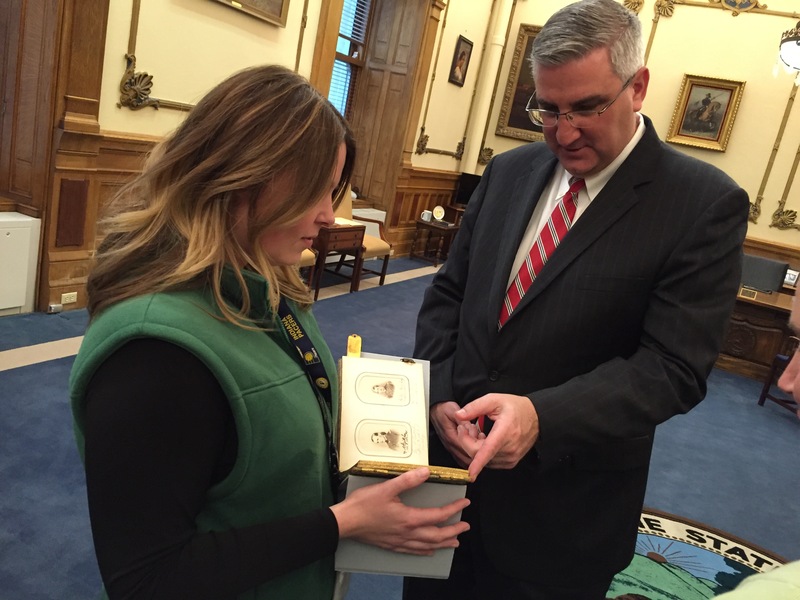 Bethany Fiechter shows Governor Holcomb a Civil War carte de visite album commissioned by Governor Oliver P. Morton. The Governor Oliver P. Morton Civil War Soldiers Photograph Collection (P001) includes three carte de visite albums to perpetuate the remembrance of Indiana regiment officers. The portraits are arranged alphabetically by last name with notations indicating the name, rank, regiment and, if applicable, place of death. L to R: Bethany Fiechter, Governor Holcomb, Laura Eliason and Connie Bruder. For more information about Governor Oliver P. Morton, view our finding aid here. Interested in more Civil War photographs? The Rare Books and Manuscripts Division has made available over 80 photographs here. The Indiana State Library Rare Books and Manuscripts Division recently acquired two Civil War-era handwritten letters by Henry B. and Sarah Ann Wilson Conn Looker. During March 1893, the couple wrote to L. T. Hewens, a medical doctor located in Oakalla, Illinois, regarding the use of an abortifacient. Henry was born in Fountain County, Indiana to George L. Conn and Nancy Bishop Conn in 1831. He enlisted in the 113th Illinois Infantry, Company D, and was stationed at Camp Butler near Springfield, Illinois. Conn died on July 4, 1863 due to an inflammatory disease while serving. Sarah was born on July 23, 1831 and married Henry, having two children: Charles Henry (1857-1933) and Ella Gertrude (1860-1928). After his death, she married Robert O. Looker and had two children: Cora May (1870-1952) and Edwin Otis (1872-1952). Sarah died on January 4, 1911. This blog post was written by Bethany Fiechter, Rare Books and Manuscripts Supervisor. For more information, contact the Rare Books and Manuscripts Division at (317) 232-3671 or “Ask-A-Librarian” at http://www.in.gov/library/ask.htm.